……. And I’m back! 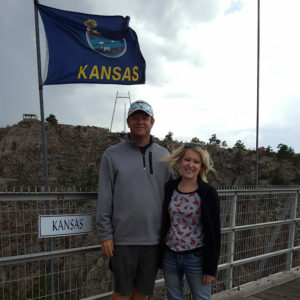 Last week we spent time in Colorado doing all sorts of touristy stuff: hiking, taking a ride to the top of a mountain, explored a cave, visited a museum, and eating lots of wonderful food (I may have to re-look at what pattern size I should be sewing now). I even (attempted to) conquered my fear of heights and tried a “Wind Walker Challenge Course” (full disclosure, I did not do the segment that was 600 feet off the ground, I got brave, but not that brave). The photo on the right was taken at the Royal Gorge bridge as we walked back across it. Now that we’re home, it’s time to get back into the swing of sewing! I have LOTS of plans so lets see how many I can tackle. High on my sewing list this week are: Betz White’s Metro Hipster with a matching Emmaline Bag’s Necessary Clutch wallet, finishing up the never-ending Sanibel Romper project and then starting a new romper, the Layton by Seamwork Magazine, and do a bit more swimsuit sewing by starting the Siren Swim Top (I also have the Hello Sailor bottoms, but want to see how this turns out first). What has everyone else been sewing up lately? This entry was posted in Uncategorized on May 31, 2016 by stacy. You see that (rather silly) face on the left and wonder what he’s doing? He’s waving “HELLO SUMMER”! That’s right yesterday, was the last day of school for the year! Although it certainly doesn’t feel like summer out there (what’s with all the cold rains? ), it is definitely a welcome break to the hub-bub over the last several months. To celebrate, I’m taking the next week off blogging (and possibly sewing) and just spending time with the family, adjusting to a new (and relaxed) schedule, and watching a few of E’s baseball games (so long as they don’t get rained out). I’ll see you all back here on Tuesday, May 31 (since Monday is a holiday), with lots of new projects, links, and fun stuff to share! This entry was posted in Uncategorized on May 20, 2016 by stacy. Get ready for summer travel by keeping all your essentials at your fingertips. Make one of these car diddy bags to stash your stuff! $425 for a denim skirt? No way. Learn how to make a Marc Jacob’s inspired skirt for much, much less (plus I actually think this version is cuter). This cute little toiletry bag isn’t just perfect for traveling, it’s inspired by an Airstream camper – making it perfect for summer adventures. Learn how to quickly transform a t-shirt into a tank top. Make laundry more fun with a fishy laundry bag! Keeping your jewelry organized (and not a tangled mess) is always a challenge when you travel. Not anymore! Learn how to sew up your own travel jewelry organizer and keep your bling tangle free! Sometimes the ‘wrong side’ of the fabric is just as beautiful as the ‘right’. Learn how to put these fabrics to good use and make a Bali Reversible Skirt. Need a new shirt by noon? Check out this tutorial for the Seafarer Top. Need an even quicker skirt? Try out this maxi design! It’s almost pool season. Get ready to hit the water with this easy hooded towel tutorial. A new take on an old favorite. This tutorial will teach you how to create a fun geometric patterned zippered bag. 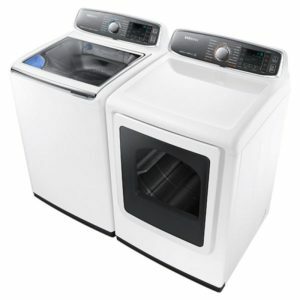 I remember in middle\high school my favorite pair of jeans were the ‘button fly’ style – why don’t they still make those? Now you don’t have to look for retail to find this fun style, you can do it yourself with this great tutorial. Father’s Day is just a month away and if you’re stumped as to what you can make handmade, be sure to check out this fun, Everyday Superhero (I may have to try this for Easton’s new room) or guitar\ukulele pillow. There is no sewing involved in this project, but this Phases of the Moon stenciled tee is too brilliant not to share! This entry was posted in Uncategorized on May 19, 2016 by stacy. Gray black lattice cotton spandex blend knit – great color and a nice weight. I’m pretty sure Taylor might snag this. Black floral garden on white cotton jersey knit – a fun print (and you know how I love black and white), but this has very limited stretch…. so much so I think it will need to be treated as a woven. If it’s not too drapey after it’s washed, this may become a new pair of Elenore Jeans. Blue yellow seagull burnout cotton jersey knit – one of my favorites of the whole bag. It has summery vibe and the colors are beautiful unfortunately it is a burnout so I’ll have to really think how I could use this because anything I make either has to be lined or needs something worn underneath it. The first thing that comes to mind is a 3/4 sleeved boatneck tee, but we’ll have to see what else inspires me. Blue green tie-dye ethnic cotton jersey blend knit – I am not normally one for the tribal or ethnic prints, but this print is gorgeous (also another favorite of the bag). 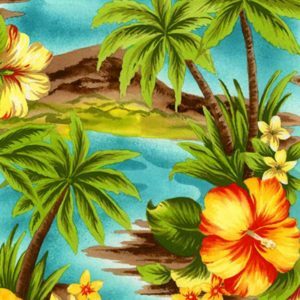 Photo floral on magenta jersey rayon blend knit – I’ve been thinking of fabrics to make Seamwork’s Layton and I believe this one may be it! Rose pink solid silk jersey rayon blend – I love pinks and this fabric is a very pretty shade. It also has a wonderful hand so I’ll have to think about how I want to use this. Maybe if I make the Elenore out of the floral print from this month, this fabric should be the top? 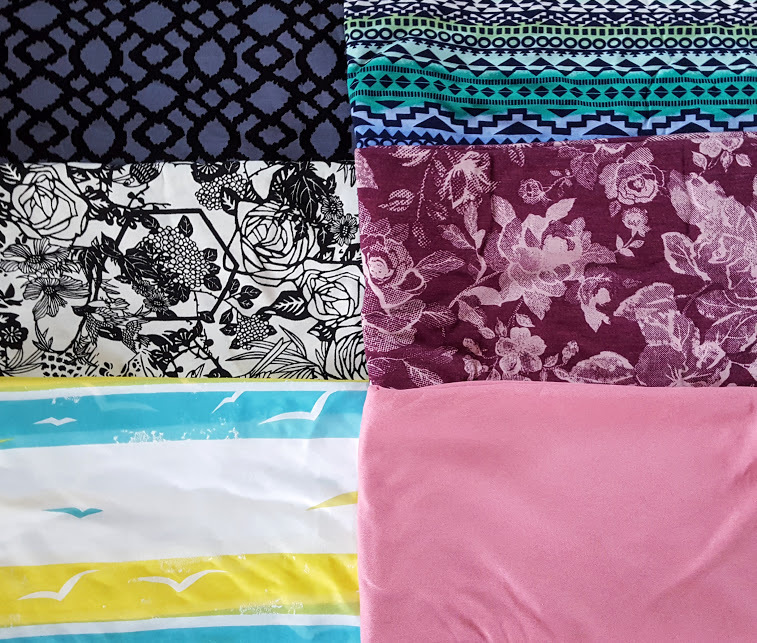 Overall, I am very excited about the fabric in this month’s bag…. now to find the time to actually sew some up! Thanks again, Girl Charlee, I love what I got! This entry was posted in Knit Fix on May 18, 2016 by stacy. 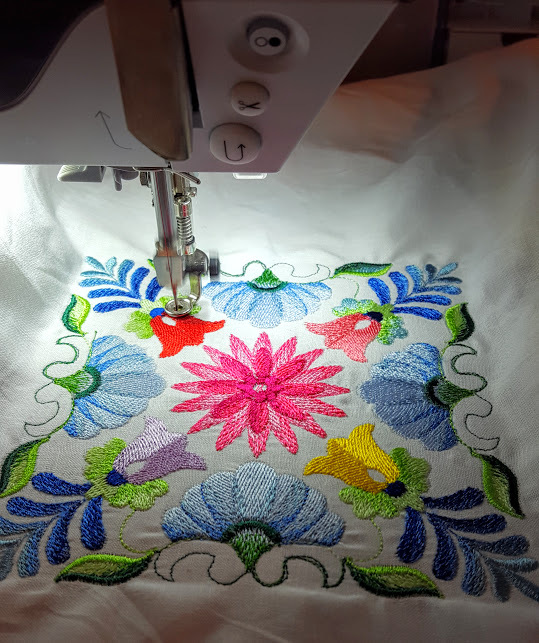 One of life’s little ironies – you have a plethora of things you want to sew, but a series of events and activities keep you from working on them…. why doesn’t this ever happen when we have a ‘dry spell’? That’s what’s been happening the past several weeks and I’ve just given up being able to tackle everything I had hoped to accomplish this month. 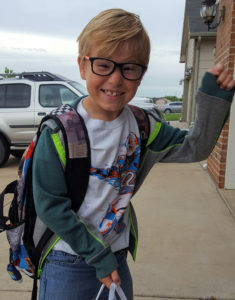 On the bright side, we’re caught up on doctor’s & dentist appointments, all of the end-of-school activities and graduations are complete (can you believe Easton’s last day of school is Thursday? ), I am the proud owner of a new (and fancy) washer and dryer set, and I have fabric arriving today. This entry was posted in Uncategorized on May 17, 2016 by stacy. As I gear up to start writing another Creative Machine Embroidery project, I realized it was also time to ‘test out’ the embroidery that I would be using. Since I can’t seem to stick with the color change sheet, I wound up pouring over embroidery threads for about an hour (plus a trip to the store, too!) 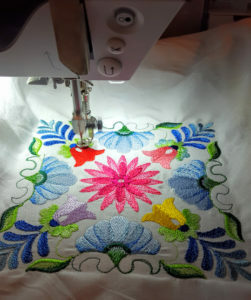 and still wound up changing my mind mid stitch (as you can see, there 4 different color tulips in the photo on the right). Finally, after an ENTIRE afternoon, I decided exactly what I wanted to do…. now to spend the day stitching it all out (full disclosure, it should wind up pretty good sized when I am finished). Next time, I may just stick with the color change sheet! This entry was posted in Uncategorized on May 16, 2016 by stacy. I recently had the opportunity to test out a pattern for Peek-a-boo Patterns called the Bahama Mama Blouson Top. This is a swim top with an optional shelf bra (and optional cups), gathered front and accent yoke with an “x-back” style design. Even though this pattern is designed for swim, it can easily be made into active or casual wear as well! It may look complicated, but the Blouson Top actually whipped up fairly quickly… just counting sewing time, I think I had this particular top finished in a long afternoon. Everything went together smoothly and even though the technique to insert the elasticized straps was new to me, it was incredibly easy. Besides the back, my favorite part of this pattern is that it’s ‘full coverage”. Not only does it look flattering on all body types, but the extra material scrunches around your midsection slightly to hide any tummy bulge. For this version I made the shelf bra (without cups) and found the fit to be perfect for me. If you’re looking at using this top as active wear, I would highly recommend looking into making this part of the garment with powermesh for additional support. 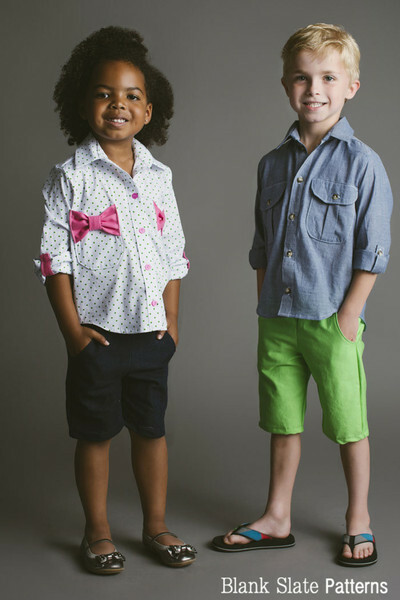 I paired my new Blouson up with the Bahama Mama Boy Shorts for a sporty look, but the bikini style looks adorable too (by the way, the boy short pattern sews up very quickly – from cutting to finished product, it took about an hour!). 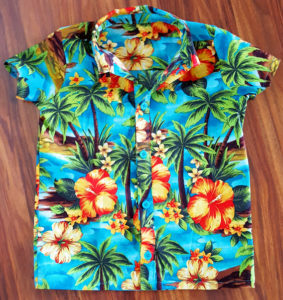 You can grab your Bahama Mama Blouson Top up today for $8.50 (this price is only good for Thursday). If buy the Bahama Mama Boy Shorts OR Bikini bottoms at the same time, be sure to enter the code “BAHAMA” at checkout for $3 off your purchase! This entry was posted in Uncategorized on May 12, 2016 by stacy. 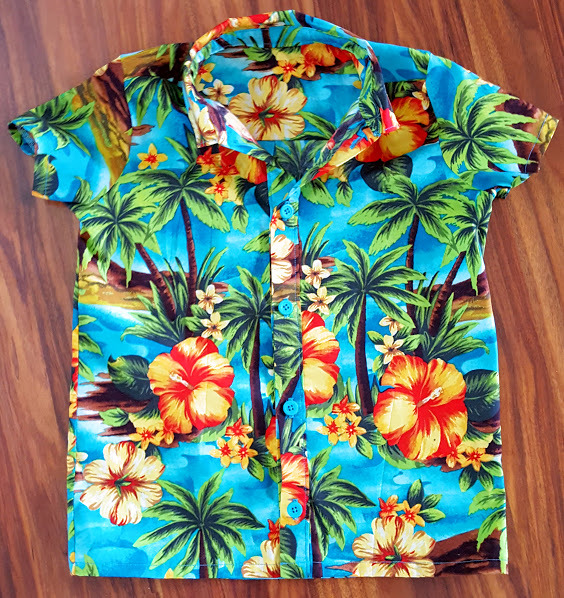 After burning the midnight oil, I am happy to report the Hawaiian Shirt Project is complete! This was my second time working with the Bookworm Button-Up (you can check out my original version here) and I found it to come together just as nicely as the first go around! For this version I went with the short sleeved option with a straight hem and no pockets in a size 8 (which is the largest that this pattern goes to). The directions are great and have lots of photos to help you along with each step – making this a good pattern to try out if you’re new to shirt making. Everything really did come together well – I’m not really pleased with my collar stand, but that is more of a ‘me being in a hurry’ issue than a pattern issue (I also had to remind myself that no one is going to be seeing the collar stand and it still look 10x better than a purchased shirt anyway!). As for the fit, it’s a bit snug. Most of that issue is due to the fact he had to wear his ‘reading shirt’ underneath the Hawaiian Shirt, but I also suspect that he’s going through another growth spell and I’ll have to re-look at what size I’m making in his patterns. Overall this shirt totally rocks, though! 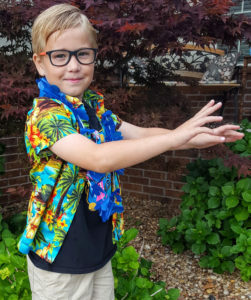 No only is he enjoying the fact he has a Hawaiian shirt (as you can see in the ‘action shot’ he’s doing the Hula), but it looks great and I was able to make this for under $8! Sometimes sewing is cheaper than buying retail! This entry was posted in Uncategorized on May 11, 2016 by stacy. This entry was posted in Uncategorized on May 10, 2016 by stacy. When I had posted about my Girl Charlee April Knit Fix bag, I had mentioned that I wanted to enter their contest for the month…. and I barely squeaked in one entry. 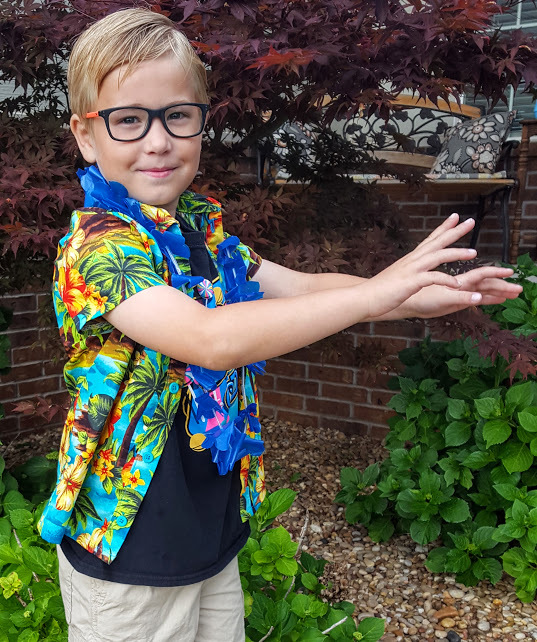 I wound up using the “Royal fuchsia Navajo brushed cotton jersey blend” and a heavily modified version of Peek-a-boo Patterns castaway cargos to make a pair of shorts for Easton. I skipped the cargo pockets (I know, the whole point of the pattern, right?) and welts, but kept the front pockets in this one. To give this pair of shorts even more punch (because let’s admit it, they are loud), I used a red along the waistband and pockets. The final result? Easton says they are the comfiest pair of shorts he owns and after working with the material, I see why – that fabric has a great hand. Now I’m wondering what I should make for myself out of it! This entry was posted in Uncategorized on May 9, 2016 by stacy.